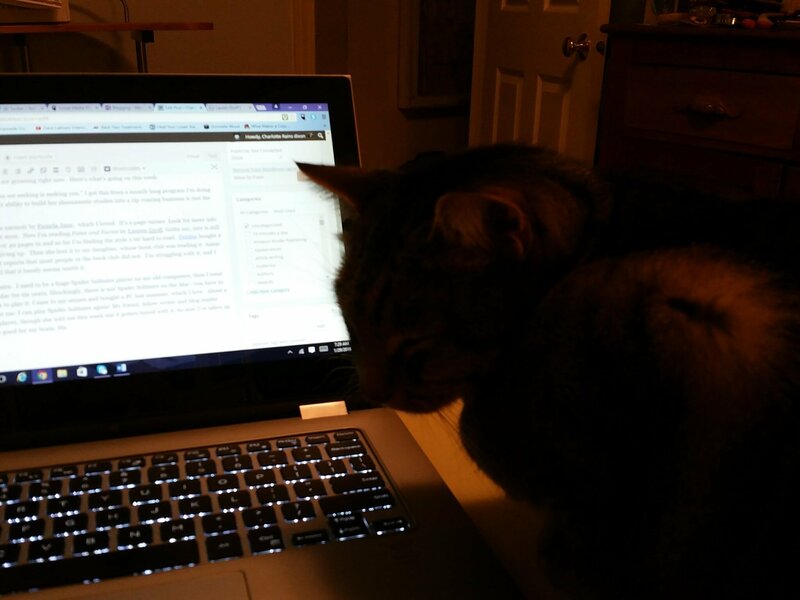 Lieutenant helping me write this post. Quote I’m loving: “That which you are seeking is seeking you.” I got this from a month-long program I’m doing with my friend Monica Kenton. Her ability to build her shamanistic studies into a rip-roaring business is just the best. What I’m Reading: I finished the memoir by Pamela Jane, which I loved. It’s a page-turner. Look for more info about the book and the author here soon. Now I’m reading Fates and Furies by Lauren Groff. Gotta say, jury is still out on this one. I’m only about 30 or 40 pages in and so far I’m finding the style a bit hard to read. Debbie bought it and got about 50 pages in before giving up. Then she lent it to my daughter, whose book club was reading it. Annie loved it, in a weird sort of way, but reports that most people in the book club did not. I’m struggling with it, and I have so many books I want to read that it barely seems worth it. What I’m Playing: Spider Solitaire. I used to be a huge Spider Solitaire player on my old computers, then I went over to the dark side and used a Mac for six years. Shockingly, there is not Spider Solitaire on the Mac–you have to go to very unsatisfactory websites to play it. Came to my senses and bought a PC last summer, which I love. About a week ago, the thought occurred to me: I can play Spider Solitaire again! My friend, fellow writer and blog reader Jenni is a crack Spider Solitaire player, though she told me this week she’d gotten bored with it. So now I’ve taken up the cause. I convince myself it is good for my brain. Ha. What I’m Listening To: Nothing. At least when I write. I used to listen to movie soundtracks, but for the past few years I’ve written in silence. I now value silence a lot. When I drive, I no longer automatically turn on the radio or pop in a CD. (I have an old car, none of that new-fangled technology wherein one can play their Ipod music or whatever.) I really prefer silence. Probably because I like to talk to myself. At home, I have a weird, old-school habit I inherited from my Mom. I have a radio playing all day long in the kitchen. My daughter-in-law once told me she’d never been in our house when the radio wasn’t on. I have listened to the same radio station for years–KINK FM. It’s actually one of the top stations in the country, known for making careers for some musicians and it plays an eclectic bunch of music that I like. What I’m Working On: My rewrite. Doing a rewrite is a strange and wonderful process. If I had more usable thoughts on it, I’d write about it. And I will one of these days. The hardest part is getting organized and finding a way in. I’ve finally managed that and seem to be rolling. Phew. What are you working on/enjoying/ excited about on this last Friday in January? PS. Don’t forget, if you live in Portland, I’ve got an upcoming reading and an upcoming workshop on publishing. Read all the details here. Oh Jenni, I love you! I’ve actually tended to forget about it over the last couple of days, so that’s good, right? And being familiar with the wonderful writing you are producing I have to say I’m thrilled you are getting bored with it! That’s a great quote. I actually love the Kelly Clarkson song, “What doesn’t kill you makes you stronger.” And yes, try journaling! But be sure to give it some time. You will have days when it feels really great and others when it is all dull and boring. Yesterday I figured out all the problems of the world in my journaling session and this morning I barely wrote anything. And besides therapy, its a great place to figure out the writing angles. I love all those journals, as you know, but a good old fashioned spiral also works! I “wandered” to the journals section though I suppose there was some wondering as well. Snow is a good excuse, too, except we never get any. But, boy do I agree that rewrites are strange things! It is quite an interesting process, isn’t it? Oh forgive me, Don, I know you are a Mac fan of the highest order! And thanks for the link. I’m working hard on my rewrite which we will re-submit to the editor and see what happens from there. Fingers crossed. Also scheming for some self-publishing ideas…you’ll read it here first! And I’m so happy that you keep coming back to read my blog. Thank you. Next PostNext Otherwhere: A Bright Shiny New Month!